I’ve been making my own almond milk and cashew milk for many years due to the fact that I’m lactose intolerant. It is always so time-consuming I have never managed to remain consistent. My previous methods included grinding the nuts in my faithful, Vitamix. (She’s been around for 15 years!) or using my Herom Juicer. 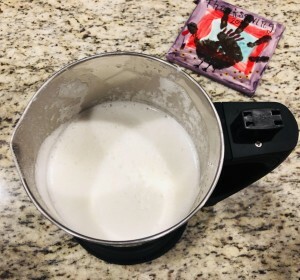 The Vitamix method was fairly simple; add water, previously soaked and rinsed nuts and give it a whirl… until you get to the straining part with the cheesecloth. The juicer method was equivalent to making juice in the machine with lots and lots of parts to wash, dry and put away. 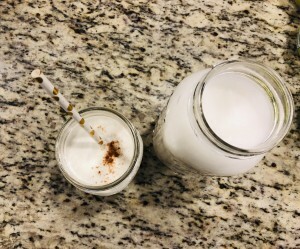 So, we end up buying the best organic, commercial milks we can find but they never taste quite the same as the vibrant, refreshing homemade milks. The Almond Cow retails for $195. It’s design is shockingly simple. When we opened up the package, we both noticed, assembly instructions were not included. That’s how streamlined the design is! I quickly started soaking 1 cup of Organic Raw Cashews and went about our day. Four hours later the nuts were ready! I added the water (Reverse Osmosis with Minerals Added Back) and pushed the Almond Cow button. 30 seconds later, we had beautiful, frothy, and delicious Cashew Milk! One cup of nuts made 1.5 quarts of milk. There are 4 cups of nuts in the Trader Joes package, $7.99. Some of the better store bought brands retail for $5.99 and up. I went on to make three more batches adding dates, ceylon cinnamon, and vanilla for flavor. Washing the machine is extremely easy. It literally only has 4 parts. Ease of use and clean up, controlling the quality of ingredients, no preservatives and having fresh milk are all reasons I highly recommend it! It is an initial investment but worth it in my opinion! This gadget is a must-have for all families that are dairy-free. If you enjoyed this blog post, share it with a friend!